Mattu Pongal is the third day of Pongal festival in Tamil Nadu. Mattu or Mathu means cattle or bull and the day is also known as Pongal of the cattle. In 2019, Mattu Pongal date is January 16. 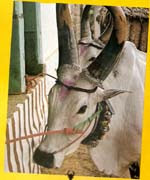 Mattu Pongal is today famous for the bullfight known Jallikattu or Manji Virattu. Mattu Pongal is a sort of thanksgiving to cow, which provides milk and organic manure or fertilizer, and bull, which draws the plough. Cows and bulls are an indispensable to the rural economy of India. On the morning of Mattu Pongal, the cattle are herded to the pool, where they are bathed and decorated. Horns are painted and are capped with special metal caps. The bulls are also adorned with garlands, trinkets and tinkling bells. They are given specially prepared Pongal and other goodies to eat. Special prayers are offered to Lord Ganesha and Goddess Parvati and pongal dish is prepared and offered as ‘prasad’. In the first half of the Mattu Pongal day, bulls are pampered and fed and in the next half, they are tortured in the name of Jallikattu and Manji Virattu – a sort of bull fighting. Ferocious bulls are specially handpicked and bags of coins are tied to the sharpened horns and they are let loose in an open ground. Young men try to subdue the bull barehanded and in the process hurt themselves and the bulls. The sport is highly popular in rural Tamil Nadu and in spite of protests from animal activists the sport thrives in the name of tradition. 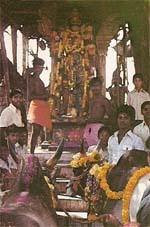 Kanuma Festival held in Andhra Pradesh during Sankranthi is quite similar to the Mattu Pongal. Why is sugarcane a must during Pongal?